Akai MPD24: Finally, Gorgeous, Serious Drum Pads for Computers? Akai’s MPC hardware was terrific in its day, launching whole genres of music. But today, software like Ableton Live (and FL Studio, and many others that function brilliantly with 4×4 sets of pads) give us the flexibility to make new kinds of music. So, even as the MPC hardware has continued to evolve, many of us want more. Now you just need a hardware controller so you can use these applications musically. Akai’s own offering, the MPD16, got just about everything wrong, with (inexplicably) a lone fader, middling pad quality, and little to differentiate itself from competitors. M-Audio’s Trigger Finger offers more controls for less money, with faders and knobs, but many of us have been disappointed with the responsiveness of the pads across their surface area. I’m preparing a review now of the Korg kontrolPAD, and its pads basically blow the Trigger Finger away; with an onboard X/Y controller it’s the perfect compact controller. But nothing gives you the full array of controls and feel of the MPC. 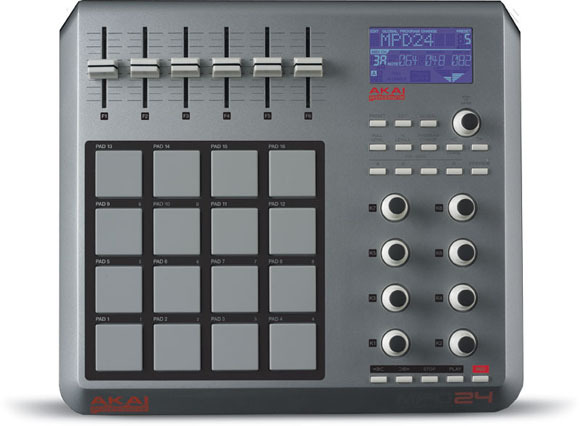 Enter Akai’s MPD24. Now this finally looks serious: a more logical array of controls and what looks like a fantastic case. 360-degree knobs: Well, okay, some of you might prefer non-continuous encoders, but for the other half of you, this will make you happy. It could finally bring MPC-style music making to the PC with all the feel of the original hardware. I don’t want to get my hopes up too high until I’ve tried it, but MPC lovers may finally have the gear they want. Someone out there is going to be running the MPD24 alongside Ableton Live 6 and doing things the first MPC users never dreamed of. Pricing/availability forthcoming. Stay tuned for more on this when it ships.